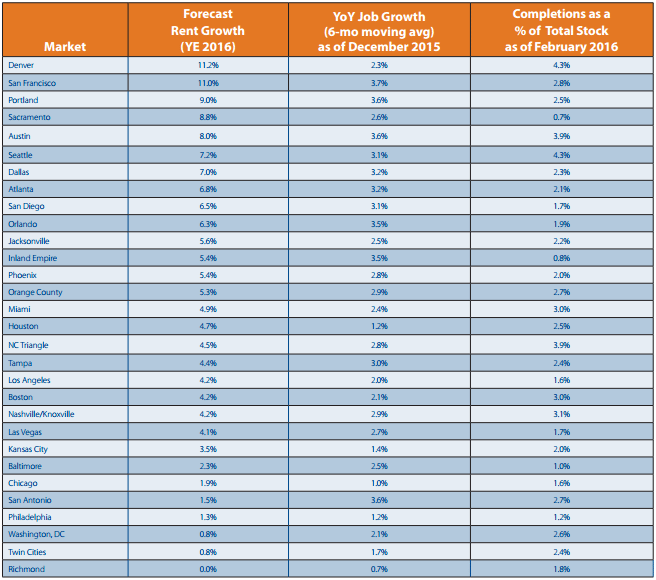 Yardi recently released its Matrix Monthly, a report covering 111 rental markets throughout the nation. February’s report found the national average apartment rental price rose $7 to an all-time high of $1,175, representing a 0.6 percent monthly gain and 5.9 percent annual gain. Rental price gains are slowing, and the experts at Yardi suggest that overall rental growth for the rest of 2016 will be moderate compared with 2015. Declining growth of technology and oil are putting a damper on markets like Denver, Houston, San Francisco and Portland. But still, the West is dominating. Portland leads the pack with a year-over-year gain of 14 percent, followed by San Francisco with 11.6 percent, Denver and Sacramento at 10.5 percent and Seattle at 9.6 percent. The experts expect a healthy year of growth throughout the nation. Housing supply, local job markets and housing costs are going to be the big three to pay attention to throughout the year. 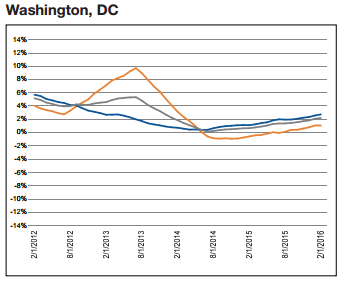 In Washington, D.C., rental growth is trailing the nation’s trends.